Can your city Support a new Professional Sports Team? Let’s start with the graphical answer. What inspired this particular graph? 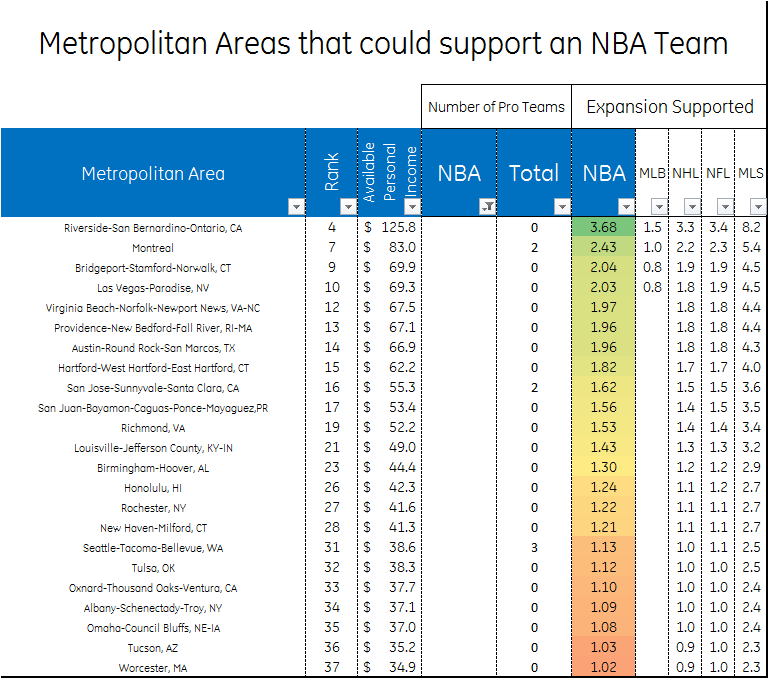 A few posts back, fellow WOW writer Devin Dignam identified 6 cities that are very difficult markets for their NBA teams. I liked this post a great deal. So much so, that I decided to extend it and flip it around. Rather than ask who shouldn’t have a team, I decided to ask who should. In my previous post on the state of the lockout, I pointed out that NBA bemoans its economic situation and shrinking profits but their approach at solving the problem is fairly narrow. The profit equation for any business is simple : Profit = Revenue-Costs. The NBA is focusing largely on cost-cutting (and mostly on the player side) and are leaving a humongous opportunity on the table to increase revenues. It all comes back to a simple question: Which cities can best support an NBA team? 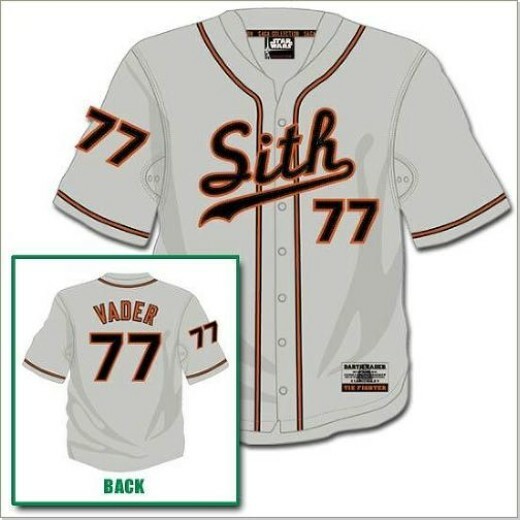 Or for that matter, any professional (MLB,NFL,NBA or MLS) sports team ? If the NBA can properly answer this question, they can go from worrying about shrinking profits and contraction to talking about record revenues and expansion. Let’s see if we can help them out (while answering the broader question). The work done in this piece draws a lot from the fantastic work by The Business Journals site in their OnNumbers section. 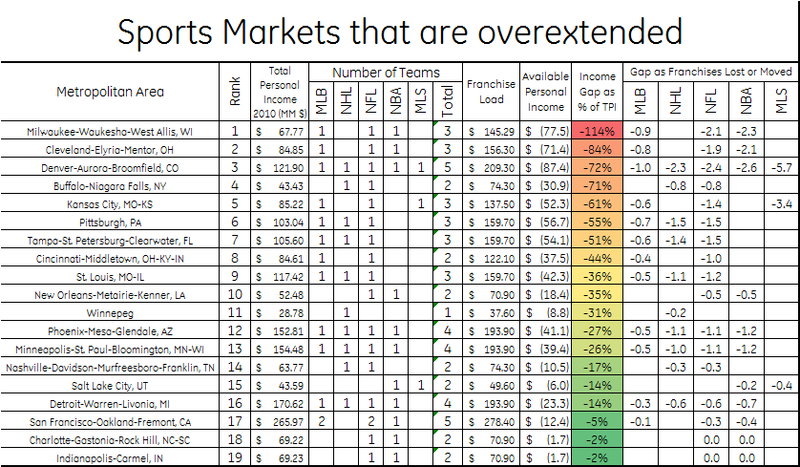 Particularly their pieces on Sports Capacity , Overextended Sports Markets, Viable NFL, MLB and NBA markets as well as the link to Metropolitan Areas Total Personal Income for 2010. The data for this piece is a drawn from the US Department of Commerce (for US markets), OnNumbers estimates for Canadian Markets, and the Goverment of Puerto Rico. “Available personal income(API)”: simply TPI less the cost it takes to support the city’s pro teams. If API is positive, it means that you are good to go for a franchise. If API is negative, then you really need to figure out where you are going to move your team. Only teams in the NFL, MLB, NHL, NBA and MLS are counted for this calculation. All that nice data is here as a google doc . Let’s start with the negatives first. 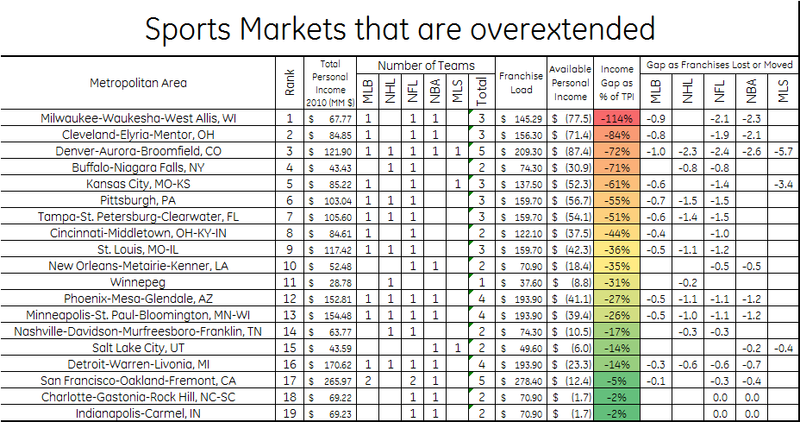 Which markets cannot support the teams they have? 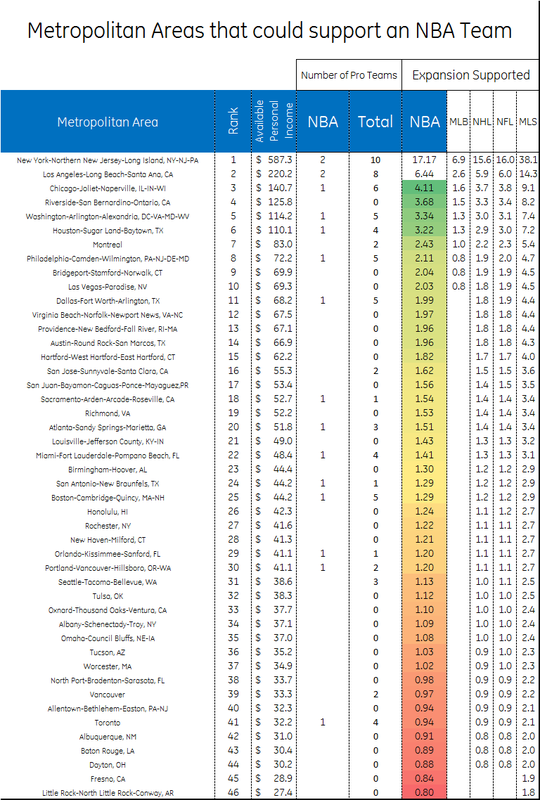 There are 19 cities that qualify as overextended. The table ranks each city in terms of the gap in income to support the franchise as a percent of the Total income for the metro Area. To me, this is an important distinction because it allows to identifies markets like Indianapolis, Charlotte, San Francisco, Detroit and Salt Lake (15 thru 19) that could very well be able to support the current franchise load if they achieve some measure of economic growth in the next few years. Milwaukee comes out on top of my rankings because I am assigning them a 70% share in supporting the Green Bay Packers. The cities in the top three (Milwaukee, Cleveland and Denver) reveal an interesting problem: as it decreases in popularity, Major League Baseball is going to find it increasingly difficult to support the current franchise load. Eight of the ten teams in the top ten field MLB franchises and would clear their gap by losing those teams. Buffalo is already in an NFL timeshare with Toronto. New Orleans had the NBA repossess their team. Winnepeg gets the benefit of the doubt in hockey-mad Canada. Victims of a bad economy: Pacers, Bobcats,Warriors,Pistons, Jazz. Cities with a johnny-come-lately MLB expansion problem: Denver, Phoenix. Candidates for relocation: Bucks, Cavs, Hornets and Timberwolves. The NBA needs to be thinking about finding markets for these four teams. Let’s identify the candidates. Every single one of those owners would see their franchise value significantly accrue from such a move. Each one would be a trade up in terms of market size and income available. An additional plus is that 3 of those markets would be NBA only and new markets for the league. Sometimes, these things just write themselves. 49 Responses to "Could Your City Give a Sports Team a Good Home?" Arturo–what was your method for assigning support for nearby teams, as you did for Milwaukee? 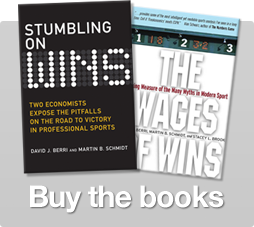 Did you take into account competition from collegiate sports? Also, rumor has it that my hometown of Columbus OH has an NHL team. Thanks for the article–sorry the game was canceled on you. I only counted pro-teams on this. Milwaukee-Green Bay is the only situation were I moved some of the cost from one city to another given that the Packers are very much Milwaukee’s team as well. I had Columbus with an NHL and an MLS team as well :-) They just could support another mls team. What about secondary league franchise? How do they impact those findings? … aren’t you badly simplifying things here? For example, who would build a “required” state-of-the-art arena in those places? As we know owners don’t like paying for it… so how is it their decision? Even if we assume that owners agree with this post… what could they do now? Start lobbying aforementioned cities? I wonder if general sport interest plays any sort of influence in this? For example the Inland Empire might be a prime market number wise but is it really a basketball region? (I honestly don´t know, I´m from Europe I never heard about it before now). A prime example might be Toronto which is a huge market but the Raptors still have no huge following same goes for Atlanta (then again those teams are bad…). Anyone has any ideas about this? Might a variable like “basketball interest” for a region be of any influence or would it just be random noise? Toronto actually has very good fan support, although it has been waning somewhat after years of bad on-court results. They’ve been pretty solid attendance-wise. I understand your point though. Certainly, interest in basketball would have an effect. The question is, how do you measure it? Perhaps you could conduct a statistically valid poll on fan interest and multiply it into the API? We would have to see how that method translates to interest in current NBA markets first before we would know for sure if it works. It´s true of course that market size does not absolve of poor management and talent (though the Clippers still seem to manage). Normally I would say college basketball support could be a reasonable estimate for NBA interest but given the realities of the US sport market (where college sports fans are not always professional sport fans) this might be too shaky. What I would like to know though is if such a factor would even influence the whole equation? This really hard for me to gauge. As an example I can give the wildly different German basketball league BBL. Since the basketball is a fringe sport in Germany (football is the 1,2,3 and 4 most popular sport and basketball fights with handball for 5th) fan interest is one of the most important factors in locating a franchise. Some of the largest German markets have no franchise (Hamburg the second largest city has none, Munich has a new team which is in the highest league just since this year and Cologne the 4th largest city recently lost its team because it was not financially viable) while one of the most successful clubs (financially and sport wise) resides in a small Bavarian town. Conversely king football laughs about fan interest as a factor in locating teams since every German is by law forced to attend football matches (or so it seems sometimes…). I’m sure it has an effect, because that only makes sense. Helps to explain how a city like Montréal could lose the Expos. The other thing that becomes clear when you look at the data is that sometimes smaller markets can be beneficial. As long as the city is big enough, being a one team city probably has its advantages. That’s why OKC is in better shape than I thought, and could help to explain successful clubs in small Bavarian towns! San Juan Puerto Rico has a brand new state of the art arena and supports a ten team pro basketball league. You could move the hornets there for this season. From a practical standpoint you have to look at arena situations as well. I think Anaheim, New Jersey after the Nets leave are obvious picks. Kansas City might work, especially if you could move the Royals. Reinsdorf would never let another NBA team be a tenant at the United Center (he’s a 50% owner of the UC), so you run into problems there. Ultimately, the league needs to subsidize the smaller market teams, for the quality of the league as a whole. Larger market owners must realize, they are afforded benefits that are protected because of relocation fees (to the league) and relocation costs. Oh and you could move the Bucks to the United Center right now (Lakers/Clippers deal). Move the Twolves to MSG as well.Cavs can go to the Hartford civic center while they build a new arena. Theoretically, Could the Bucks and Twolves move to Chi/NY? Absolutely. Would Dolan or Reinsdorf go for either? Very Unlikely. Unless of course they’re getting a substantial rent fee (much higher than the “market” price). At which point, both those teams are making the same or less than in their current markets. I suppose you could make the argument that there is enough money in the larger market to go around, even after the rent. However, Dolan and Reinsdorf are going to be very risk averse- charge an extreme amount/flat out not be willing to rent building, they do not want to risk their brand name to a newcomer. How would the existing NBA franchise’s territorial rights play into these scenarios? For example, the Nets had to pay the Knicks to operate their franchise in the Knicks’ market. I assume there would be the same hurdle for franchises in Chicago, Connecticut and California. As a soccer fan knowing MLS could be in 100+ markets means their anti-Promotion/Relegation stance is a joke. AKI is exactly right. I am trying to set up the United Rugby League. Right now it’s tough just to get started. If God willing I can get it going the long-term goal is precisely to have pro-rel in American team sports. For more information please visit http://www.unitedrugbyleague.com, join the FB page or follow @UnitedRL. Thanks. Great article, Arturo. I’d love to see an NBA team in the Riverside/San Bernardino area. I don’t think people realize just how big that metro is: it’s more populated than both Phoenix and Denver, both of which have all four major pro sports teams. That’s nuts! The biggest obstacle is a lack of a building to play in, and since owners are fond of shaking down the public for money to finance new stadiums, and California is in absolutely no position to pay for a new stadium right now, it’s probably a no-go for a while. Montreal, on the other hand, already has the relatively new and surely NBA-ready Bell Centre. David Stern is constantly talking about spreading the NBA brand across the globe, so why not move the league-owned Hornets up north and make Montreal the NBA’s first francophone locale! Arturo, you just made the best argument for promotion and relegation in US club soccer that I’ve ever seen. Thank you. Given that I am a huge futbol fan (and a fan of the best soccer team playing in the states the PR Islanders), I am glad. The PR Islanders make a pretty good case for it as well. However, culture and politics really do seem to have a major governing influence on whether a city can support major league sports. Cities with very conservative politics are unlikely to support highly competitive activities, though only Tulsa, Omaha and perhaps Louisville would be remotely affected by this problem of the cities you are suggesting. 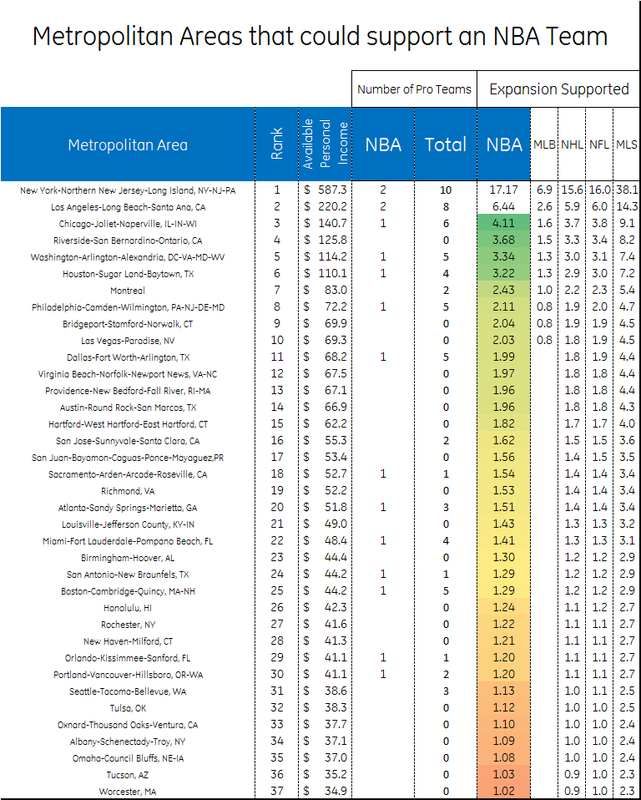 Montreal has little interest in basketball and a very low proportion of blacks (who tend to be the best players) and Hispanic Tucson which would otherwise be a good choice (but probably more likely to support MLB than any other major league) has the same problem, as does Las Vegas to a lesser extent. Another is demographic change: suggested cities are losing people due to low fertility rate compared to more conservative and less competitive cities. Is the CFL (Canadian Football League) a factor in Canadian Markets? Wouldn’t that take some sort of available income in cities that house NHL clubs already? While it would appear on paper that LA could support an NFL team, the fact is they have proven in past that they will not/cannot support an NFL franchise. Could this change? Sure but I would have to see it to believe it. Arturo do you have an update on this list for 2013? I think Orlando could support an Nfl, MLB and MLS team. The NHL would be a stretch. I live in Detroit and a diehard fan of all the teams except for the Pistons because my mother is from Orlando so I grew up liking them. They could seriously support more teams, the economy is very good, we have stadiums and the fan base is very loyal. Have you ever been to an Orlando Magic game? It’s crazy.